An estimated 800,000 government employees have been caught in the political crossfire of the shutdown, now in its fifth week. President Donald Trump's proposal to reopen the government, which outraged immigration hard-liners on the right and was instantly rejected by Democrats, is headed for a vote this week in the Senate, where it will probably fail. An estimated 800,000 government employees have been caught in the political crossfire of the shutdown, now in its fifth week. Roughly 380,000 federal workers have been furloughed and 420,000 are working without pay. 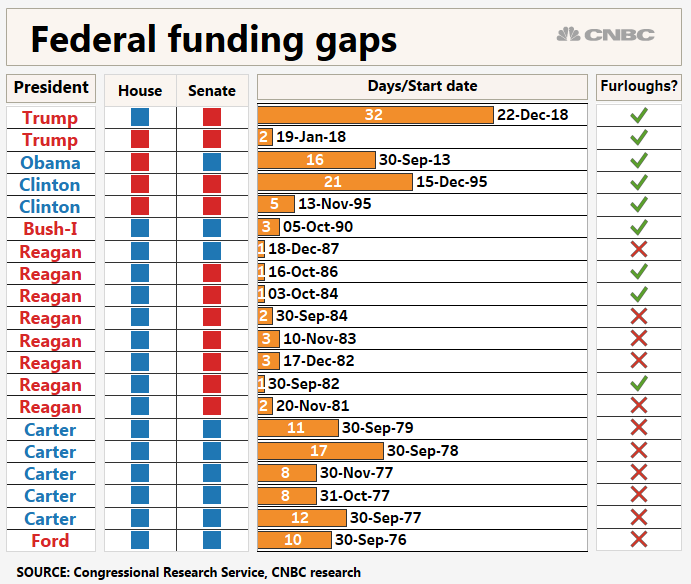 The impact of the government shutdown on the overall U.S. economy, so far, has been limited. Yet, just as the economic effect is concentrated on furloughed workers, some companies and industries are taking a bigger hit than others. Commercial airlines, for example, are facing slower demand as airports struggle with understaffed security checkpoints, are losing revenue. Last week, Delta said it had lost $25 million in revenue on account of the shutdown. The hit to the overall gross domestic product in the first quarter is also difficult to quantify. Economists have come up with a range of numbers, but they agree that the longer the shutdown goes on, the wider the damage to economic growth. There was little indication Tuesday that the standoff would end anytime soon. President Donald Trump's proposal to reopen the government, which outraged immigration hard-liners on the right and was instantly rejected by Democrats, is headed for a vote this week in the Senate, where it will probably fail. The study looked at the effects of the 2013 government shutdown on nearly 7,000 federal workers – both those affected by the shutdown and not – along with more than 90,000 nonfederal workers. This Saturday, Jan. 12, 2019, selfie photo provided by Haley Hernandez shows herself, a stay-at-home mother of four and wife of an active duty member of the U.S. Coast Guard, in Corpus Christi, Texas. Hernandez said she has applied for free lunches for her children, and she is awaiting an electronic food stamps card in the mail. She wonders how they will pay their $1,400 mortgage. Overall, the affected workers didn't rely on credit cards to make up their lost wages, but postponed making payments on outstanding debt. Kohler, who makes $38,000 a year, said many co-workers are in the same predicament. Not a single one has been approved for unemployment, he said. Kohler said workers like him are stuck in a difficult position, in part because they are restricted by government ethics rules from getting many kinds of outside work. "When it gets to a point where government employees have to go to a food bank, this is not the America that I grew up in," he said. "It's mind-boggling. It really is."